In this episode of Tubby Talk, Terry, Steve, and Chris conclude their discussion about the console wars with the events that lead from the dawn of 3D gaming to the modern era. 1982's Joust was one of the first video games to popularize two-player cooperative play. 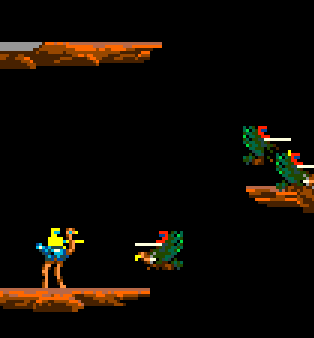 Featuring knights mounted on flying ostriches, players wage war with an army of buzzard-mounted adversaries. The key to successful engagements is to touch enemies only when you are higher than them.